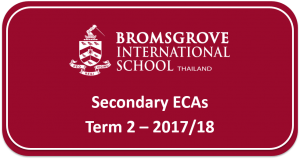 We are delighted to share our ECA programme for Term 2 with you. We have a varied and inspiring range of ECAs on offer and we hope your child will continue to enjoy extending their learning through this programme. We are offering a breadth of opportunities across sport, academics, the arts and life skills. We expect students to choose ECAs from the three strands across the week to broaden and enhance their extracurricular time. Year 9 students will all be taking part in the Expedition and Survival Skills ECA as part of their enrichment programme. Many of the popular ECAs from Term 1 will run this term as well, so students who did not take part last term, have the opportunity to experience these activities. We ask for your support to guide your child in their ECA choices and if an ECA has an additional cost, separate parental/guardian consent will be sought before a student is enrolled in the ECA. Please note that your Activities and Sundries Deposit balance will be used in the first instance to pay for this activity and by giving consent you authorise the Finance Office to debit your balance accordingly. We cannot wait for our Term 2 ECA programme to begin!